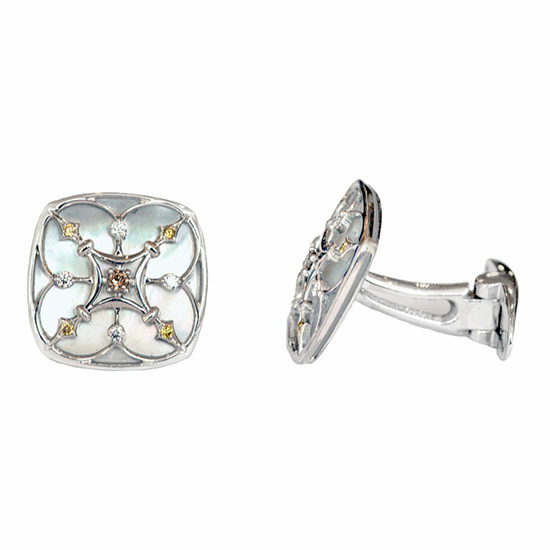 Marisa Perry mother-of-pearl cufflinks with white and fancy colored diamonds in 18k white gold. These make the perfect groomsmen gift, Father’s Day present or gift for anyone who loves cufflinks. Gender neutral, these cufflinks are perfect for any lover of cuff candy! Conceived by Haute Jewelry designer Douglas Elliott for Marisa Perry Atelier, a luxury jeweler in New York City’s West Village. These cufflinks are hand sculpted by a master jeweler in 18k white gold in a snowflake pattern. Each cufflink’s snowflake pattern contains four perfectly matched white diamonds, four hand selected fancy yellow diamonds and a fancy brown diamond center. Total diamond carat weight is 0.50 carats. White gold and diamond snowflake pattern is set above lustrous mother of pearl. Each cufflink is hand made by a master jeweler in Marisa Perry Atelier’s New York City studio.